March | 2015 | bevieann61's Blog. about books!!! Usually we focus on the heroine and hero, but I though it would be fun to let our secondary characters shine today. If you have buy links or social media links, please post them as well. Here two of mine from A Kiss for Lady Mary. Lady Eunice Phipson, is my heroine’s aunt and Mr. Brian Doust is the local vicar. Author Jude Knight’s Farewell to Kindness Release Party March 31st 2:00 to 8:00 Pm EDT. Best Selling Author Jude Knight’s Farewell to Kindness Release Party!! Please join us and support this amazingly talented author! A chance to meet other authors and win prizes! A night you will not forget!! Look forward to seeing you at the party! 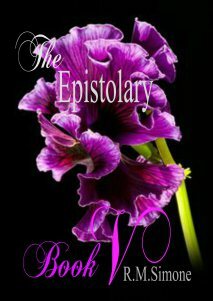 The EPISTOLARY by r.m.simone’ PART OF BOOK V Saga..
BOOK Reveal Cover REVEAL …BOOK V, The Epistolary by r.m.simone’ Prelude The Epistolary … and so it begins…. Within the darkness sits waiting this moment of the Kiss that brings forth the Spirit of the Soul into the Darkness of the eternity. Of the Soul that is VOID of Light of the Self. It is this Spirit that is carried within the heart beating of the Beloved that Kindles this Awakening. I have gone through such an Awakening. Scandalous Endeavors by Amanda Marie !! Can’t wait for this one!! The first one was awesome! !